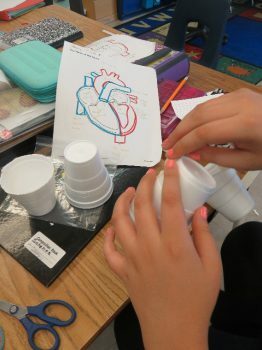 This week, students created 3D models of the heart using paper cups, string, scissors, markers, and tape. The students wrapped up the Human Body unit about a week ago so we have decided to focus on the circulatory system this week. The students enjoyed the opportunity to create their own heart model because it allowed them to use their creativity, apply their previous knowledge about the heart, and work with their peers. It was also a nice break for me, since I didn’t have to talk the whole time and students were able to explore on their own. 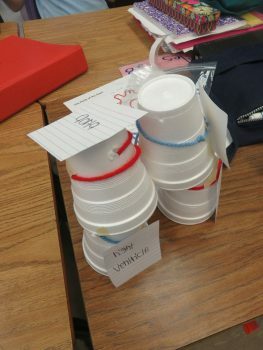 I’m still trying to find the balance of providing students with structure and modeling as well as giving them the opportunity to think for themselves and discover on their own. In other news, this week I also attended the fine arts event at the Lookingglass theatre company where they performed Beyond Caring a play about temp workers. It was a little unnerving with all of the loud noises and some of the content, but I enjoyed the performance. It’s always nice to go to the art events to mingle with Chicago Semester students from different programs and catch up with my fellow student teachers later in the week. This week, we reveled in the fact that one of them had gone to see Hamilton this past weekend and that we are nearing spring break! This weekend, I took advantage of the weather and had a bonfire at a friend’s house. I can feel spring is in the air, which means a break is coming soon! This next week is my last week of full control! We will be wrapping up poetry by analyzing Count on Me by Bruno Mars and Roar by Katy Perry. Students will also begin discussing the respiratory system before we start our next unit after break. I will also have my first interview at a charter school and get my edTPA score back, let the final stretch begin!